A recumbent bike provides you with the same workout intensity as an upright bike except that you are in a horizontal position. Chair with backrest provides excellent support for your back, and since you are in an inclined position, you will not get strained. It is a hands-free bike exerciser, too. You can tinker with your smartphone or laptop or even read a book while in it. Since recumbent bikes are more comfortable, you will most likely have a longer workout session while in it. This means you will be burning more calories. Not to mention the fact that your legs will have to work more to fight gravity in a horizontal position. The Exerpeutic Folding Recumbent Bike (400XL) is a top seller! With an assembled dimension of 46” H x 19” W x 33” L and folded dimensions of 54” H x 17” W x 20” L and weighing only 39 pounds, this compact, lightweight and portable bike stores easily and can be moved with so much ease. This recumbent bike can fold to a neat half of its already small assembled size. The V-belt comes in double-drive transmission and combined with an accurate and well-balanced flywheel ensure you have a smooth workout without disturbing anyone with a noisy exercise equipment. The 3-piece cranking system (high torque) allows smooth and steady pedaling. Being a semi-recumbent bike, users weighing up to 300 pounds will find it easy to get in and out of it. The large seat and backrest of the Exerpeutic Folding Recumbent Bike are comfortable allowing you to workout longer than intended. It can easily be adjusted to accommodate users from 5 feet to 6 feet tall. Exercisers can adjust their workout intensity from easy to difficult with the 8 level Magnetic Tension System. There are hand pulse sensors on both handlebars which you need to hold so your heart and pulse rate firmly will register on the LCD screen, as well as time, speed, distance, and calories burned. Positioned between the leg area, the 3.3” x 1.5” LCD screen comes has large numbers for easy viewing (2 AAA required; included). This semi-recumbent bike is easy and quick to assemble. All required tools come in the box. The Exerpeutic Recumbent Bike (900XL) is a durable recumbent bike that costs less than $200. It comes with a simple set-up and basic features but nevertheless provides extraordinary cardio workouts. Tension level can be easily adjusted from easy to difficult with the 8-Level Magnetic Tension System. Hand pulse sensors are on both handlebars for easy viewing/monitoring. Cushioned seat with backrest is sturdy and large enough to accommodate a user of up to 300 pounds. The seat can be easily adjusted for users between 5 feet 3 inches and 6 feet 3 inches. Comes with extended leg stabilizers to keep it steady. Pedals with straps are large enough to prevent feet from slipping. Accurately balanced V-belt drive and flywheel ensure noise-free and steady operation. User-friendly LCD shows speed, time, distance, calories burned, heart rate and scan. The Exerpeutic Recumbent Bike (900XL) is 34” H x 22” W x 54” L and weighs 63 pounds. It has wheels for easy transport within the home. This recumbent bike comes with a 3-year frame warranty and 90 days on parts. 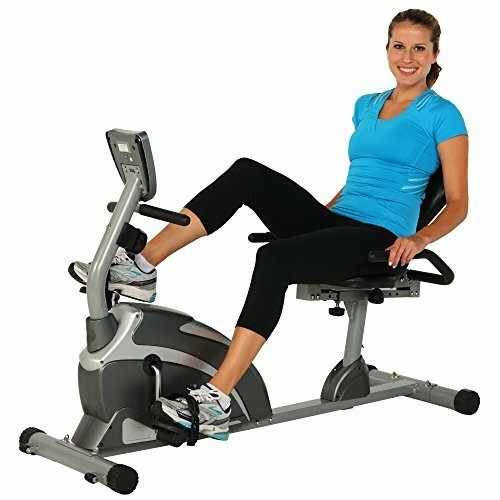 The Marcy Recumbent Exercise Bike (ME 709) is one of the best-selling recumbent bikes. It features 8 Magnetic Tension levels to allow you to adjust resistance levels. The dial with tension levels of 1 to 8 is easy to use with equally easy to read numbers. Metric Display has easy to read time, speed, distance and calories burned data. Weighted pedals with straps to keep your feet in place are solid, steady and wide enough to comfortably fit your feet. It also has grooves for more traction, and it can be pedaled either in clockwise or counter-clockwise motion. Seat with backrest is comfortable even when pedaling at highest speed. It is also adjustable for multiple users of different heights (5 feet to 6 feet). Padded adjustable handlebars allow your hands to rest comfortably while paddling. 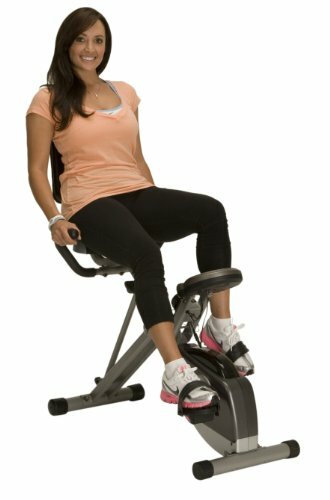 The Marcy Recumbent Exercise Bike (ME 709) is 55” x 40” x 25” weighs 66 pounds and has a user weight limit of 300 pounds. The 2-inch steel tubing in 14-gauge molded ABS of this bike prevents it from wobbling while in use. This recumbent bike comes with wheels for easy movement from one room to another. Burning calories, increasing stamina and improving your cardio resistance is such a breeze with this recumbent bike from Marcy. At only a little over $100, it has all the features you need for a smooth workout in your home. 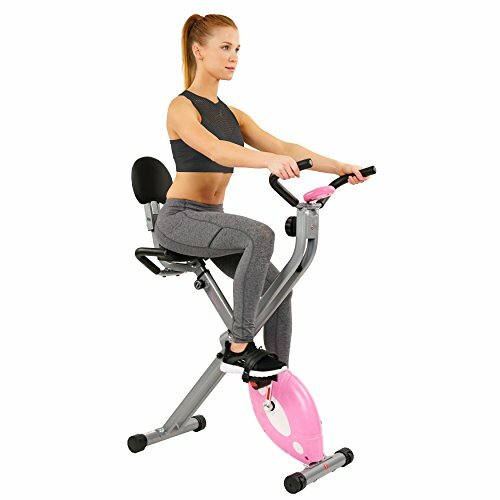 Whether you are a novice or a fitness guru, you will find the Schwinn Recumbent Bike (270) as being the best recumbent bike in the market. For less than $400 you will be getting an exercise equipment with only the best features to make losing those excess fats and staying fit a worthwhile activity. This recumbent bike is equipped with 29 pre-set workout programs. Workout programs include: 12 profile programs including 4 mountain rides, 4 fun rides and 4 challenges; 4 beginner, 4 advance and 1 custom workout for heart rate control; 4 custom user defined to store personal info and workout data; 1 beginner and 1 advanced fitness tests to measure improvements, 1 quick start and 1 recovery test to measure speed of heart rate recovery. For a choice of workout intensity, it comes with 25 resistance levels. For consistency and a smooth workout, it is equipped with a high inertia drive system and high-speed 17-pound flywheel. To monitor heart rates, there is a heart rate monitor on the handlebars and a capability for telemetry heart monitor (chest strap not included). The seat is easily adjusted with an Aluminum slider seat rail system. Padded seat, large vented backrest and shapely leg area for utmost comfort while working out. 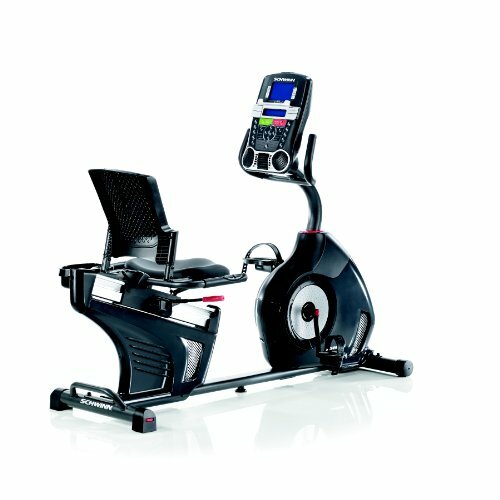 The Schwinn Recumbent Bike (270) has built-in speakers with iPod® and an input port for an MP3 player. It is capable of USB and Bluetooth data transfer from the Nautilus® Connect and MyFitnessPal (apps for calorie tracking) or Schwinn Connect™ (fitness dashboard for tracking of workout metrics). It also has a 3-speed cooling fan and a water bottle holder for comfort while exercising. Easy to use Blue DualTrack™ LCD window with backlight to access workout data: time, distance, speed, level, distance, heart rate, resistance, calories burned, resistance and revolutions per minute. Maximum user weight for this bike is 300 pounds. This recumbent bike comes with wheels for easy transport. Warranties include ten years for the frame warranty, two years for mechanical parts, one year for electrical parts and a 90-day labor warranty. AC/DC power adaptors included. For less than $100 you will be able to get a durable folding recumbent bike from Sunny Health and Fitness. It has a relatively basic design for light to medium workout intensities. It is a compact bike with an assembled dimension of 46” H x 19.5” W x 32” L, an approximately folded size of 50” H x 20” W, weighs 36.8 pounds and with a maximum user capacity of 220 pounds. This bike comes with a steel construction making it sturdy, stable and wobble-free when in use. Bike comes pre-lubricated. The seat can be adjusted up and down (for users between 5-6 feet) by loosening the adjustment knob (pull pop-pin, slide seat to desired height, insert back pin into provided holes and tighten). A tension knob controls the resistance level from very easy to moderate. Although you won’t be able to get an intense workout, you will get to sweat and loose some calories. Belt drive enclosed in the pink casing ensures smooth pedaling. Pedals and straps secure your feet in place. Pedals are at an angle in front of the user and a little bit below the seat classifying this item as a semi-recumbent bike. This bike from Sunny Health and Fitness comes with two handlebars. You can be in a semi-recumbent position to enjoy an easy to moderate workout with your arms resting on the side handle bars. You can hold on to the handlebar in front for a more intense workout. This is also a noise-free bike and folds easily for easy storage. It has an easy assembly with required tools included. Console (2 AA batteries required and included) of this bike is likewise basic. Speed, time, distance and calories burned show one at a time or in scan mode. Large console display tracks time, speed, ODO, distance, calories and hand pulse. 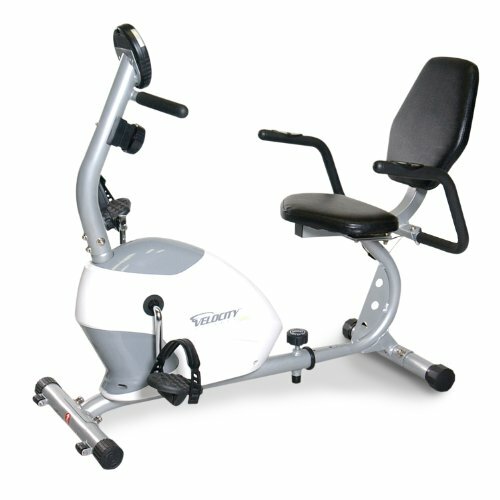 The Velocity Exercise Recumbent Bike (CHB-R2101) is an entry level exerciser with outer magnetic control. It comes with eight manual resistance levels ranging from light to High-intensity interval training (HIIT). It gives a smooth ride even at maximum level because of its 2-way flywheel. The Flywheel Technology also ensures an almost noise-free operation. The 3-piece crank system ensures smooth pedaling. Pedals with straps are large enough to avoid slippage. Clockwise and counter-clockwise pedaling is possible (when pedaling counter-clockwise, the distance will not be counted). The padded seat can be adjusted to fit multiple users. Handlebars are also adjustable and have heart rate monitor sensors. The Velocity Exercise Recumbent Bike (CHB-R2101) has an easy to read digital monitor that tracks speed, revolutions per minute (rotation frequency), time, distance, heart rate and calories burned. It also includes an Odometer to track accumulated distance “pedaled.” The console is adjustable for easy storing and runs on 2 AAA batteries. This bike exerciser has wheels in its front stabilizer making transport easy. 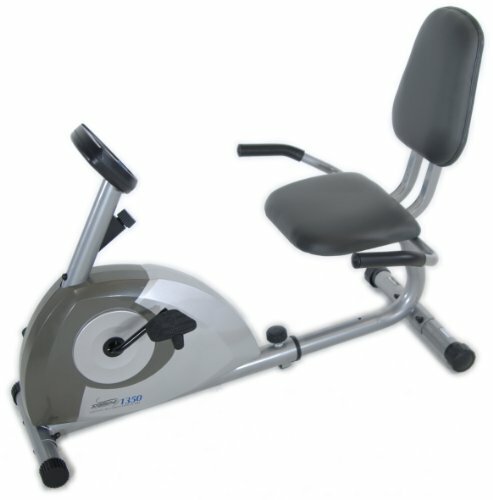 The Stamina Magnetic Resistance Recumbent Bike (1350) is a low impact exerciser. It can be adjusted to accommodate multiple user heights. Magnetic resistance is controlled by the tension knob ranging from light to moderately tough. This machine features a belt drive with weighted flyweight for smooth and quiet operation. It comes with large pedals with a textured surface for good grip to prevent feet from spilling off. Pedals are weighted to ensure smooth pedaling. Clockwise and counter-clockwise pedaling is possible. Distance pedaled is recorded even when pedaling at counter-clockwise. Padded seats with backrest is comfortable. Handlebars are padded and give a good grip. They are well angled and does not give any pressure on your back when pedaling. The Stamina Magnetic Resistance Recumbent Bike (1350) has an almost noise-free operation. Stamina InTouch monitor has large numbers and shows data on time, distance, speed and burned calories one at a time with scanning function. To save on battery life (2 AA batteries), console turns off automatically when the bike is not in use for 4 minutes. The console is low enough and does not distract your view should you wish to watch TV while pedaling. It has dimensions of 50” L x 24”W x 33.5” H when assembled. It weighs 54 pounds and can hold users up to 250 pounds. Its compact design allows it to be stored with ease when folded. This bike is designed to work on your buttocks, thigh and hip muscles. This bike comes with a 1-year frame warranty and 90 days on parts. The ProGear Recumbent Bike with Heart Pulse Sensors (190) is a simple and highly affordable exerciser. Although described as a recumbent bike it has a semi-recumbent design with the seat slightly high, and the pedals angled midway between being in front of you and below. It is equipped with a 3-piece cranking system (high torque) and a V-belt drive for consistent, smooth and noise-free pedaling. It is equipped with 8 resistance levels with an adjustable knob. Transitioning to the next or previous level is smooth. It is a low tension bike with a magnetic tension system for an easy to moderate cardio workout. Large pedals with straps come with textured surfaces for the needed grip for regular or athletic shoes. Large padded seat and straight up backrest are comfortable. Semi-recumbent design allows you to easily to get on and get off the bike. The console of the ProGear Recumbent Bike with Heart Pulse Sensors (190) is located below allowing you to watch TV while working out. LCD gives basic readouts (one at a time) on time, distance, speed, burned calories and pulse rate. It also has an odometer to track accumulated distance. Pulse rate sensors are on the handlebars (a firm grip gets the reading on the console). This bike weighs 38 pounds with dimensions of 38″ L x 21″ W x 44″ H and folds to a small 21”x 19” x 45”, compact enough to fit under your bed. It has a maximum user weight capacity of 275 pounds and can fit users between 5 feet 2 inches and 6 feet 2 inches in height. This easy to assemble bike (wrench and screwdriver included) easily folds to half of its original size. It comes with transport wheels for easy mobility. 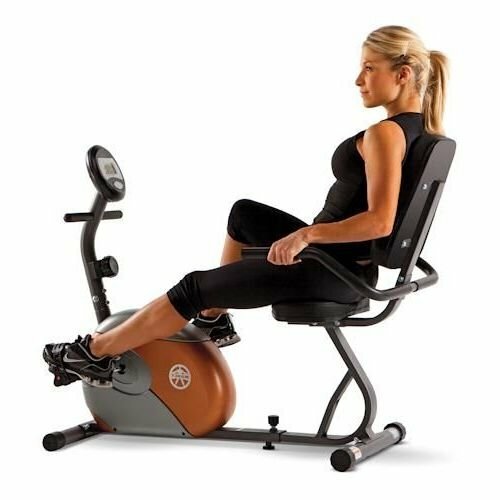 The Nautilus Recumbent Bike (R614) is an affordable (below $600) exercise considering its solid quality and multiple features. It is equipped with 22 built-in workout programs (1 Quickstart, nine profile, two user profiles, 8 for heart rate and two fitness tests). This bike comes with two levelers, a center support and rear stabilizer with large crossbar tubing making its platform solid and sturdy. It will not wobble even when set at the highest intensity level. It comes with 20 resistance levels in small increments with ten quick jump level buttons. To increase resistance, magnets move close to the flywheel and the reverse to reduce resistance level. Magnets do not touch the flywheel thus this bike is noise-free. High speed weighted flywheel with high inertia perimeter allows for a smooth workout. Console features 2 LCD monitors for easy tracking of your workout. It is equipped with a USB charging port and is capable of data exchange with MyFitnessPal and Nautilus Connect for workout tracking of progress. It also includes speakers with top quality sound. The seat is well ventilated at the back and bottom making it cool and comfortable. Adjustment to suit different user heights is easy with the Sliding Seat Rail System (for users 4 feet 11 inches up to 6 feet 3 inches. Seat adjustment is not limited to pre-set positions. 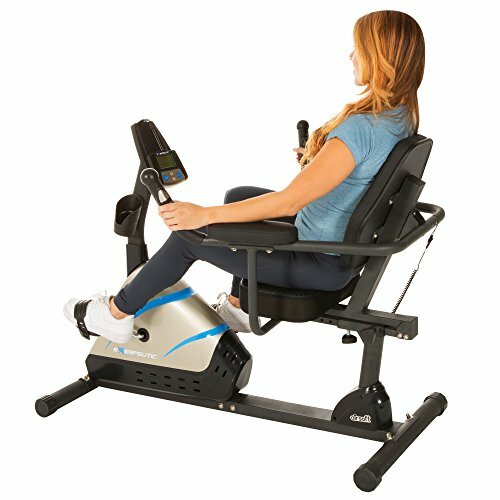 The Nautilus Recumbent Bike (R614) has a noise free operation regardless of speed and intensity. Pedals are of normal size and are textured with plastic straps for slip-free use. Maximum user weight for this bike is 200 pounds. Pedals can fit up to a size 11. Grip heart rate is ergonomically positioned on the handlebars for a more relaxed and comfortable workout when on the heart rate program. For added comfort, this bike is equipped with a 3-speed fan. This item comes with a 10-year frame warranty. 2 years mechanical, one-year electrical and 90 days for labor. The Exerpeutic High Capacity Programmable Magnetic Recumbent Bike (2000) is loaded with a lot of features for utmost efficiency and comfort. This bike is equipped with the precision balanced flywheel. It is equipped with eight resistance levels adjustable from easy to difficult. It runs on a V-belt drive and is noise-free. Large pedals with straps ensure a secure workout. Workout data is easily readable on the LCD console with large numbers including speed, time, rotations per minute, distance, resistance level, calories burned, pulse rate and scan. Heart rate is monitored through grips in the handrail. Simply position your arms on the handrails and hold the sensors. For a more exciting workout, choose a heart rate zone and exercise to enhance your heart’s performance. The console also features an iPad holder and bottle holder which do not hinder the view of the console display. The bike comes with six pre-set programs (interval, manual, hill, plateau, valley and climbing) with four settings are included in this recumbent bike. 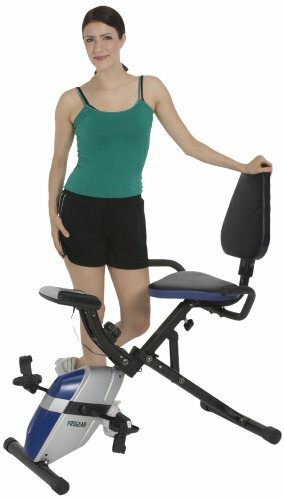 The “Air Soft” seat of the Exerpeutic High Capacity Programmable Magnetic Recumbent Bike (2000) is 3 ½ inches thick and comes with air chambers which give shock absorbing and weight dispersion benefits for ultimate comfort. The sides are upholstered with honeycomb mesh and the cushion with a soft PVC material increasing airflow for added comfort. Seat comfortably fits users between 5’3” – 6’3”. The backrest is likewise padded. The seat is adjustable with a knob below. It is easy to get on and off this recumbent bike. Maximum user weight is 300 pounds. This machine is 34” H x 22” W x 54” D and weighs 63 pounds. Wheels are attached for easy transport. Learn more about how a Recumbent Bike can improve your workout. A recumbent bike provides comfort while exercising. While it is a low-intensity exerciser, it allows the user to exercise longer and in a consistent manner. That said, recumbent bikes are perfect for burning those excess calories without any strain on your legs.